Poor Suzie – Dad has set the kitchen on fire again and Mum has turned the rain on indoors to douse the flames. JP has flown straight into a wall, and the dog, Pucker, is a whirlwind of paws and ears and noisy howls. Meet the Powers: the not so super superheroes. On a visit to The World-Famous Museum of Pirates and Buccaneers, the Powers discover a history of pirates stealing from the locals in the seaside town where they’re on holidays. Two suspicious sailors convince the Powers that pirates are plotting their return to the town, and when JP spots a tall ship at sea, havoc ensues as the Powers try to save the day. 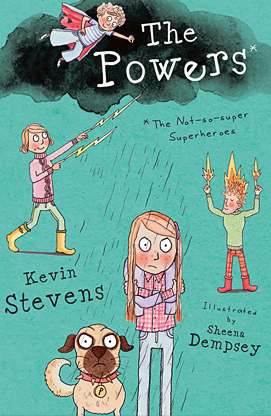 Only Suzie, whose family is sure she has no superpowers at all, can keep things under control. But for how long?